Southern California is renowned for its happy animal companions—and in few places are they welcomed more than in Santa Monica. After all, four-legged friends love the sunny weather and outdoor activities as much as their human counterparts, and can enjoy outdoor dining, walks along the boardwalk, and even VIP pampering at the area’s finest spas. Healthy and friendly dogs can run off-leash at any of Santa Monica's dog parks! Make sure to secure a non-resident dog license by calling the Santa Monica Animal Shelter before giving your dog the opportunity to cut loose. Airport Park Dog Park: Dogs can run free at Airport Park Dog Park in the Ocean Park/Santa Monica airport neighborhood. This dog park has separate areas for small and large dogs, and is open Monday through Friday from 7:30am to 8:30pm, and Saturdays, Sundays, and Holidays from 8:30am to 8:30pm. The park is closed for maintenance every Monday and Wednesday from 9:30am to 11:30am. Herb Katz Dog Park: In the Main Street neighborhood, take your furry friends to Herb Katz Dog Park at Joslyn Park, which has separate areas for small and large dogs. The park is open Monday through Friday from 7:30am to 8:30pm, and Saturdays, Sundays, and Holidays from 8:30am to 8:30pm. The park is closed for maintenance every Tuesday and Thursday from 9:30am to 11:30am. Memorial Park Dog Run: If your dog just needs to run out some energy, try the Memorial Park Dog Run in Mid-City. The long expanse of fetch-worthy space is open daily from 6am to 8pm, and is closed for maintenance every Thursday from 9:30am to 11:30am. Pacific Street Dog Park: Let your dog loose at the conveniently placed Pacific Street Dog Park, located at the corner of Pacific and Main Street in the Main Street Neighborhood. This off-leash dog park is open Monday through Friday from 7:30am to 8:30pm, and Saturdays, Sundays, and Holidays from 8:30am to 8:30pm. The park is closed for maintenance every Wednesday from 9:30am to 11:30am. Bayside Hotel: The chic and affordable hotel is located steps from the beach, and charges a $50 non-refundable fee for pet visitors. Fairmont Miramar Hotel & Bungalows: As part of its PAW (Pets Always Welcome) program, this Wilshire Boulevard neighborhood hotel welcomes pets with a bed, bowl, and treats at no extra charge! Guests can also spoil their pets with 10 percent off products, doggy day care (for dogs under 30 pounds), and grooming services with the hotel’s exclusive pet store partner Healthy Spot. Hotel Casa del Mar: This grand beachfront hotel welcomes up to two dogs in your room for a $125 fee. JW Marriott Santa Monica Le Merigot: This upscale hotel charges a one-time $150 fee per stay for each pet. 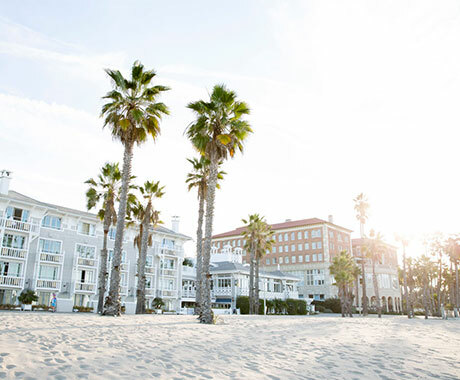 Le Meridien Delfina Santa Monica: One dog weighing 40 pounds or less can join you at this newly renovated property for a non-refundable $100 deposit, plus a $25 fee each night. Loews Santa Monica Beach: This beachfront luxury haunt charges a $100 fee for up to two pets. This fee includes creature comforts like beds, bowls, and treats, and they even offer a gourmet pet room service menu. Shore Hotel: Both eco-friendly and pet-friendly, the Shore Hotel allows up to two dogs to stay in each Garden View Room for $100 each week. Shutters on the Beach: This luxurious beachfront hotel welcomes dogs for a $125 cleaning fee. You must call the hotel in advance if you wish to bring more than one dog. The Georgian Hotel: Ocean Avenue’s Art Deco hotel charges $100 each week for residing pets. Viceroy Santa Monica: Up to two dogs 50 pounds and lighter can join you in your guest room located just steps from the beach. A dog bed, water bowl, and dog food are included in the $50 per dog, per night cost. 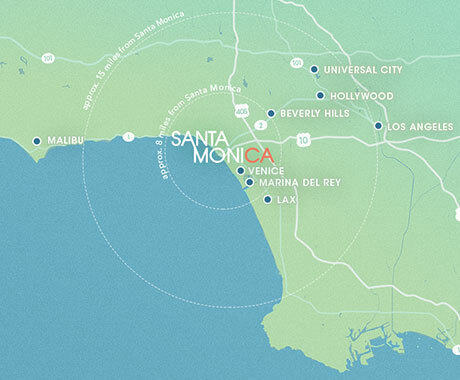 Wyndham Santa Monica: Close to the Santa Monica Pier, the Wyndham allows multiple pets for no fee. Using public transit around Santa Monica and Los Angeles is possible with pets, but make sure you have a sturdy carrier with you. On the Big Blue Bus and Metro Expo Line, pets must remain in a carrier, and must fit on your lap or at your feet. For cab services or on-demand rides, the decision of whether or not to allow a pet is left up the discretion of the driver. Enjoy your favorite outdoor activities with your canine companions. Take a scenic beachside or neighborhood run along Palisades Park and the San Vicente Median Strip. You can feel the sand beneath your toes at Santa Monica’s beautiful public beaches, but your pets have to enjoy the ocean view from a distance, as pets are not allowed on Santa Monica State Beach. They can, however, take a leashed stroll along the Santa Monica Pier and surrounding boardwalks. For day trip options, take your leashed pets on beautiful hikes in the Santa Monica Mountains in pet-friendly areas such as Leo Carrillo State Park, Solstice Canyon, and Temescal Gateway Park. Il Forno Trattoria: Ocean Park’s family-friendly Italian place leaves room on the patio for your favorite four-legged friend. Rosti: Enjoy Tuscan cooking along Santa Monica’s romantic Montana Avenue, where your dog might even be able to find a date on the patio. Spitfire Grill: Take in a view of the Santa Monica Airport’s classic runway while your dog relaxes from his romp at the Airport Park at Spitfire’s casual patio. Swingers: This retro-cool diner offers up a little bit of everything on their menu, and welcomes dogs at their outdoor seating area. The Misfit Restaurant + Bar: Handcrafted cocktails and farm-to-table fare are this trendy lounge’s specialties, and they also pour a mean bowl of water for visiting dogs. If you're headed to a “humans only” establishment, drop your pet off for a day at the spa! Pamper your dog or cat at Bark Williams, the punny spinoff of VIP spa Burke Williams. Not only do they offer full-service grooming, but they also have a "yappy hour" from 10am to 2pm Monday through Thursday, when you can self-wash your furry friend for $10. Another standout salon is Paws & Effect Pet Spa, which offers unique services such as blow outs, brush outs, braiding, coloring and even pedicures. What better way for your pet to show off their trip to Santa Monica than with some glamorous souvenirs? To Wag For is filled with pet fashions galore, while Healthy Spot has everything your pet needs for its new Santa Monica-inspired vegan and gluten-free lifestyle. Don’t forget to grab some fun toys at Animal Kingdom! To keep pets happy and healthy, both the City of Santa Monica and the Centers for Disease Control and Prevention have animal health policies. If your dog is over four months old, he or she must be licensed and vaccinated for rabies. When entering the United States from abroad, all animals must have a health certificate written in English from a licensed veterinarian. Dogs entering from certain countries must also receive a screwworm treatment between prior to travel. For a comprehensive look at regulations, check the CDC website, the California Department of Public Health website and the Santa Monica Animal Control website. Other than designated off-leash dog parks, pets must be on leashes of 6 feet long or shorter at all times in Santa Monica. Help keep Santa Monica in its beautiful, pristine condition by cleaning up after your dog. Other than outdoor patios, by law, pets are not allowed inside buildings or restaurants. When staying at a hotel with your pet, never leave it unattended and uncrated, and watch out for separation-induced barking that may bother other guests.